Job transfer request letters are generally written by employees who want to shift to another branch office location of the present employer. Sometimes, employers can also request job transfer to an employee. 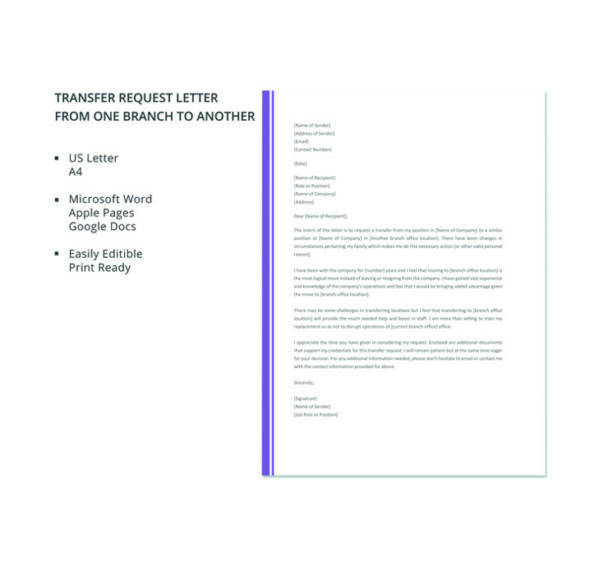 In both of the cases, request transfer letter has to be crafted with perfection. Writing such letters is always a confusing job, and to make your job easier you should use the online samples or templates. Various kinds of job transfer request samples are available, written from different perspectives. Transfer request letters are basically the letters that have been written to transfer of job or job location to the employer. Such requests are made by the employees. Team leaders or other Senior Managers can also make such request to the HR department and directors of the company. Transferring employees is a strategic decision. It brings balance in various branches or units of a company. Apart from headquarters, other branches have to be managed by spreading human resources and talents evenly. 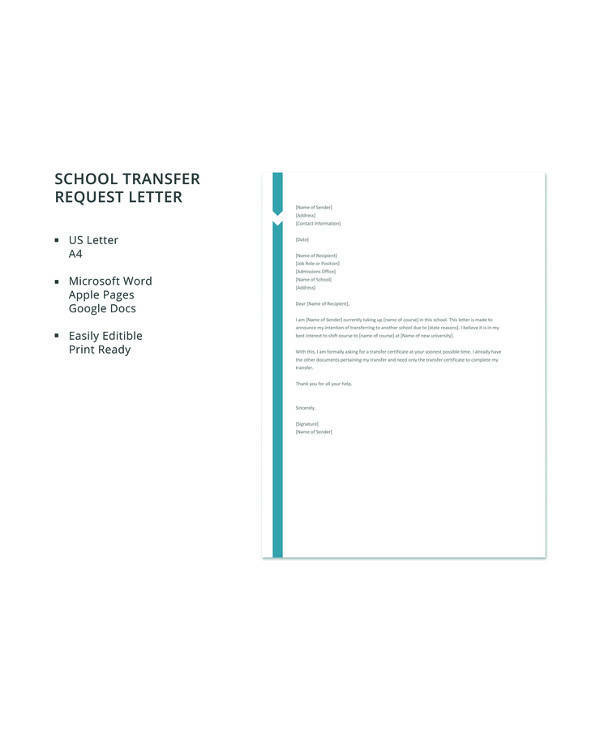 To write a simple and seamless transfer letter, you can use the templates that are available online. You may also see employee transfer forms. 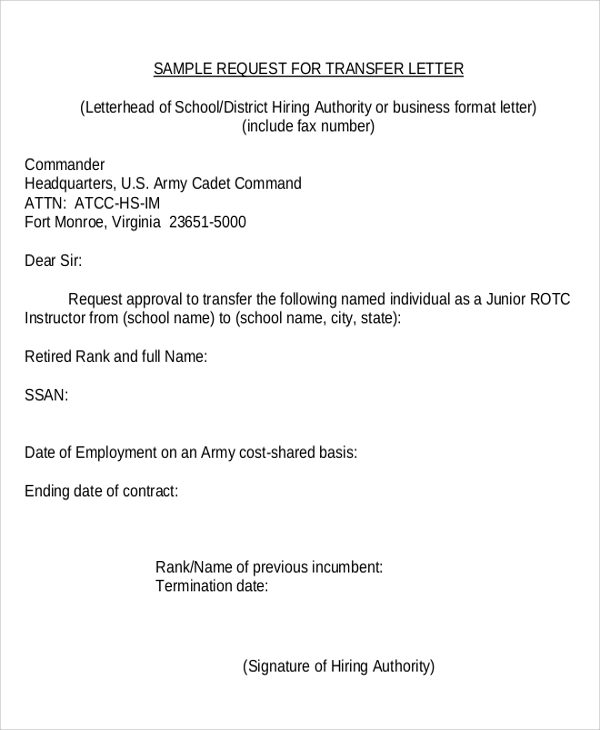 If you want to make a formal request for a job transfer to your employer, you can use this sample or template for job transfer letter. It is easy to download. Just customize and print the letter to use it. School transfer request has been made by the students who are shifting to a new place. Many parents of the school kids have transferable jobs. To write school transfer letter, this sample or format should be followed.You may also see job letters. Internal transferring means transferring an employee from one department to another. 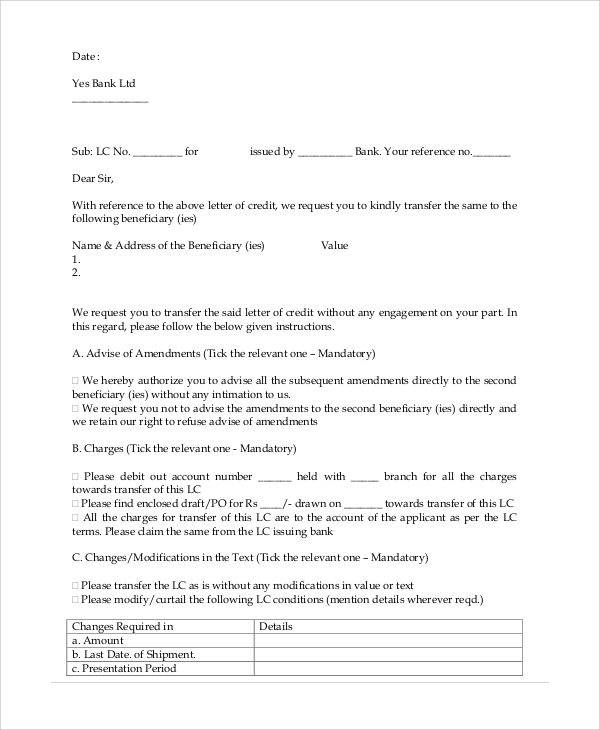 For making such requests to the employer, employees can use this simple and easy to use the template. It is available in PDF file format.You may also see formal request letters. 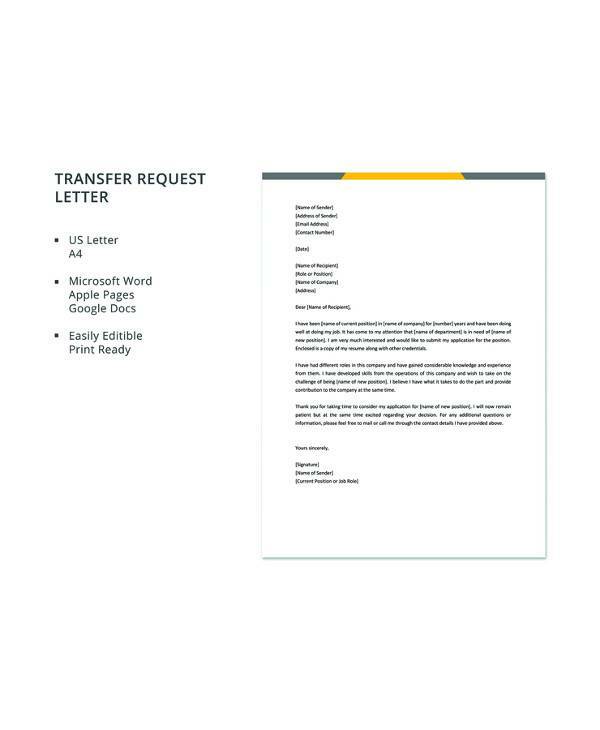 Who requires having Transfer Request Letter Templates? A work transfer letter has been furnished by the employer to a certain employee or a group of employees. Typically, the letter comes with a certain format. Instead of employers, employees too sometimes decide to get transferred to a new location for convenience. In that case, they need to make a request for job transfer through a piece of letter. This letter has been known as job transfer request letter. It should be written in professional style. The format must be accurate, while write-up should be concise. The reasons for seeking job transfer should be strong. 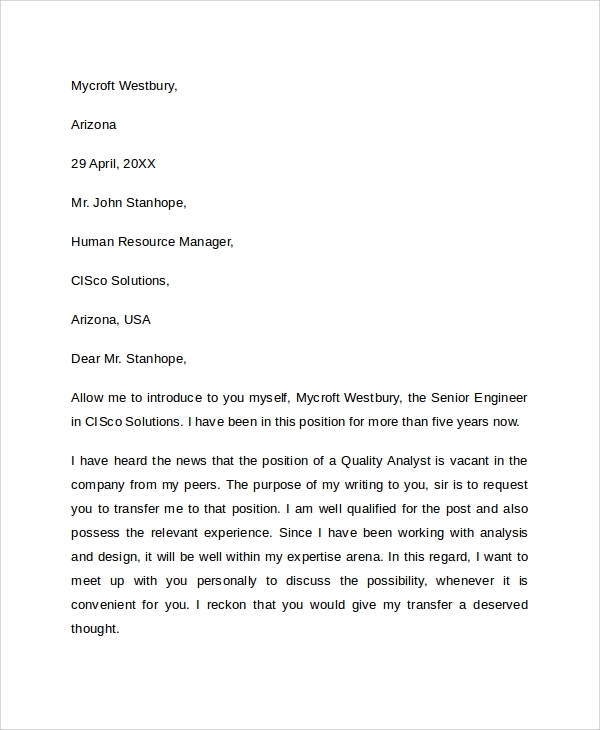 To write such letters, using templates is the best thing to do.You may also see job letter formats. Using transfer request letter template for seeking job transfer from employee has so many benefits and those benefits are listed below: Professional letter writing should be accurate in terms of maintaining format. 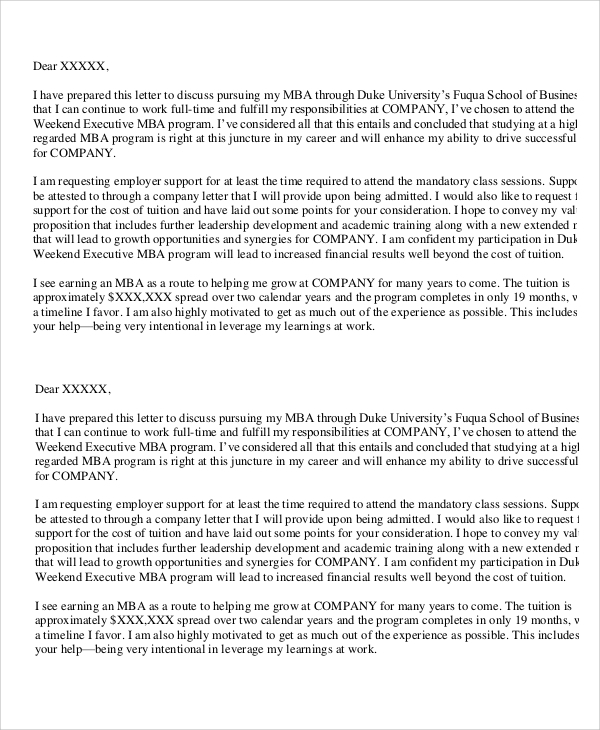 Using template helps to maintain Professional Letter Format. 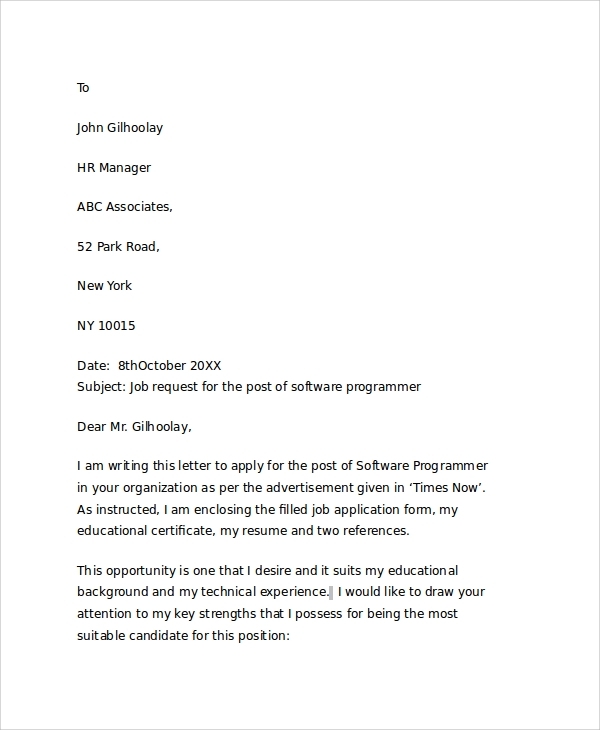 Writing job transfer letter is simple, but letter writing tone should be professional. To write letters in right tone using samples is recommended. Job transfer letters must be written flawlessly, and using templates will reduce the writing hassles. Using templates or samples for writing transfer request letters is always time-saving. Different kinds of samples are available online – choose the right sample to craft your letter with precision. Job transfer of an employee is not just a decision that comes from a management of the company. It is a decision that comes from the parts of employee too. Often many employees request job transfer to their employers. To make such requests, a flawless letter has to be written. For that purpose, online templates can be used.You may also see material request forms.